The luxury real estate market has seen a shift in consumer preferences as tastes and needs evolve. In the past, wealthy buyers desired things like high-end kitchen appliances. Today, buyers in the luxury real estate market in New York consider amenities and the convenience they bring to their daily lives. This is why hotel-style living is appealing to a large segment of luxury buyers. Of course kitchens are equipped with the top appliance brands in these residences, but, here, residents are exchanging the use of their appliances for in-room dining prepared by celebrity chefs at the push of a button. We also take a look at the price of some suites at various hotel/condos in the city to compare what it would cost per-night to stay vs. monthly renting. Perhaps the most attractive feature of hotel-style living is the amenities that come along with it. Being attached to a hotel gives residents access to the hotel's features. Concierge services have become very desirable because they allow the resident to have more time to do what matters to him or her. Just like hotel concierge, they will help residents do things such as make reservations, find gifts, or acquire event tickets. Another amenity that attracts interest is the access to restaurants by celebrity chefs...in your own room! At 30 Park Place, residents will enjoy options from Wolfgang Puck's CUT, while residents at The Mark can get dishes by Jean Georges delivered to their apartment. Additionally, residents have access to state-of-the-art fitness centers, housekeeping services, and valets. From an investment standpoint, these buildings can be more advantageous than other condos and co-ops. If you are looking to purchase and then subsequently rent out the unit, hotel-style buildings generally have more relaxed leasing terms. This means that something like a 6 month lease is generally allowed while they are often prohibited in many other buildings. Tenants will also have access to all the great amenities that a typical condo will not have, a big appeal to prospective renters. Brand recognition is also appealing from an investment standpoint. An international buyer can rely on brand recognition to help their investment. For example, buying into 30 Park Place means buying into the Four Seasons, a brand recognized globally for their standard of excellence. Brand recognition can also be helpful for owners looking to use the unit for rental income. Renters in the luxury market can feel confident about their selection with the hotel name behind the building. Additionally, it is appealing to rent an entire apartment inside the hotel for the same price as one of the best suites the hotel offers directly. Corporate renters are attracted to these brands, and generally pay top-dollar for rent while looking for the flexibility of shorter-term leases. The residences at The Mark take advantage of all the 5-star hotel has to offer. Residents can order room service from the Mark Restaurant by Jean Georges and have a Frederick Fekkai Salon located downstairs. The Mark is located on Madison Avenue on the Upper East Side, moments from world-class shopping, Central Park, and many museums. The Plaza is one of New York's icons, steeped in a rich history. The private residences, many which have wonderful park views, are decorated in the grandeur of the Plaza, with ornate finishes. Living in The Plaza comes with its perks such as access to Les Clefs d'Or concierge, daily house keeping, and valet parking. Other New York favorites are located just below such as Palm Court and the Food Hall which has an oyster bar by Todd English. 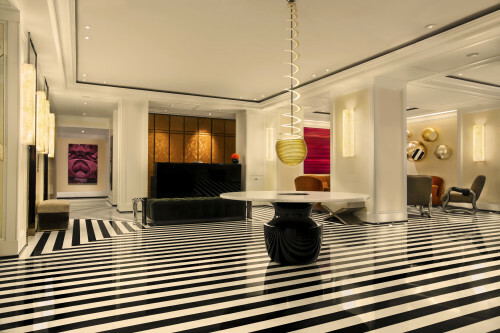 The residences at the Baccarat Hotel set a standard for luxury. Everything from the marble and Zircote wood resident's lobby to the grand salon exude luxury. Residents at the Midtown hotel have access to an exclusive list of amenities including a La Mer spa, 24-hour room service, and personal shopping. If you are looking for a nightcap, step down to the signature bar where drinks are served in Baccarat crystal. 30 Park Place is the first private residences in New York by the Four Seasons brand. Residents will experience the standard of excellence for which the brand is known the world over. The homes are beautifully designed by Robert A.M. Stern Architects and have captivating views of Manhattan. Looking for an in-room meal at the push of a button? No problem. Wolfgang Puck and his steakhouse, CUT, will be located right downstairs. Below are 2 listings currently on the market that exemplify hotel-style living in New York. This is a beautiful 3 Bed, 3.5 Bath at The Mark Hotel represented by our colleague Oliver Brown. Custom designed by Jacques Grange this home is impeccably finished with coffered ceilings and custom solid white oak floors. Features include an expansive sunny corner living room with open southern views. The windowed eat-in kitchen was designed by Piero Lissoni for Boffi, with Sub-Zero refrigerator, Gaggenau cooktop and oven and Meile dishwasher. The luxurious master bath features floor to ceiling white marble slab walls and Lefroy Brooks fixtures. There are two additional bedrooms both with en-suite marble baths. In addition there is climate control and power window shades in each room. Meile washer and dryer, state-of-the-art Crestron system and 24 hour room service, full-service gym onsite, Fredric Fekkai salon and The Mark Restaurant by Jean-Georges. This unit would rent for $55,000 the entire month or $70,000 with room service vs a 2 Bedroom suite for $3,995 a night at The Mark. AVAILABLE IMMEDIATELY. Be the first to live in this pristine 3 bedroom, 2.5 bathroom home at the newly constructed Robert A.M. Stern designed Four Seasons Residence in TriBeCa. This forty-fourth floor apartment of the building offers stunning views of One World Trade, the incredible Oculus Terminal, and the downtown city skyline, as well as western views to the Hudson River. High ceilings and large windows allow plenty of sunlight throughout the day. The master bedroom has a western exposure, large walk-in closet and gracious en suite marble bathroom with deep-soaking tub and custom vanities. The kitchen is outfitted with top-of-the-line appliances including Gaggenau stovetop and oven, Miele vent, and U-line wine cooler, and ample pantry space. The Four Seasons Residences offers 5-Star living and a private full amenity suite for residents, including a fitness center, spa and salon, 75 ft.indoor pool, children's playroom, screening room, landscaped public plaza, parking garage, resident lounge, a la carte hotel services, a coming Wolfgang Puck restaurant, CUT, and full-time doorman and concierge. Nearby to the Financial District, Brookfield Place shopping and dining, and extensive public transportation access. Interested in hotel-style living in New York? To learn more about buying or renting in a New York hotel, please reach out to use with any questions. We are happy to help! Newer PostHave You Seen the Oculus in Downtown Manhattan?